The bikes that made their way to the track up Bluff Hill in the Pre ‘82 class at the 2015 Bluff Promotions NZ Hill Climb Champs were a diverse range of machines. 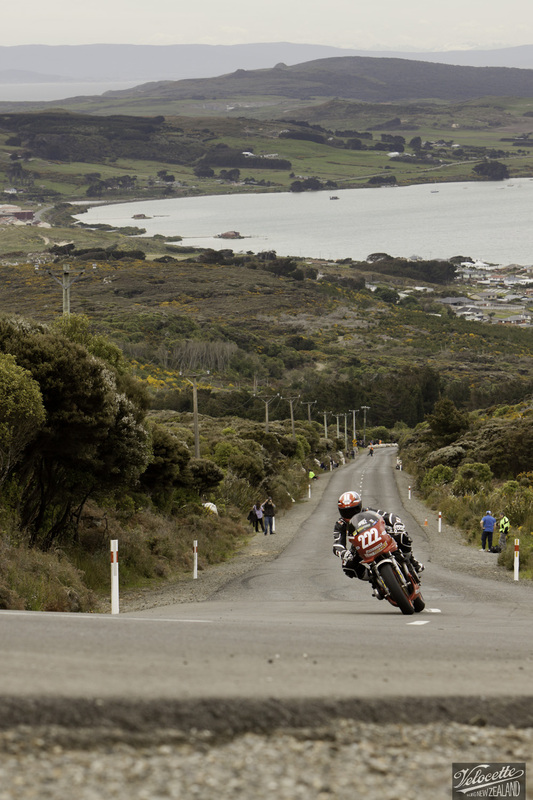 They ranged from hot street bikes to high performance sidecars, while the intrepid riders hailed from Invercargill to Waihi, Timaru, Greymouth, Geraldine, Richmond and Pahiatua to participate in this thrilling event that kicked off the 2015 Burt Munro Challenge. The Post Classic Pre ‘82 class are motorcycles built or manufactured between 1st November 1972 and 31st December 1982. With scenic Bluff Harbour and Southland’s distant hills draped as a backdrop Kevin Kinghan lines up the final turn aboard his 1978 Suzuki GS1000S 1085. 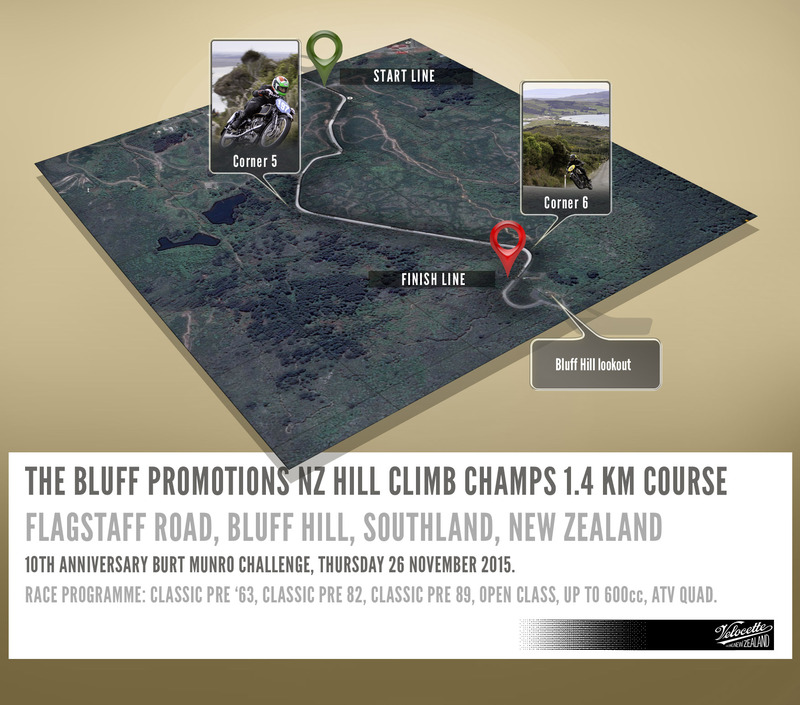 The priority in shooting Classic Motorcycle action photography at the Burt is of course the need for speed, but on the Bluff Hill Climb course there is also the opportunity to select viewpoints that simultaneously allow the capture of a backdrop of signature Southland scenery. The speed of the photographer’s eye and quick reactions to anticipate and catch the moment, the speed of the camera, tuning the settings and reacting smoothly and quickly to capture the sharper image. Most of the time good sports images are taken when the subject is in motion, with Classic motrocycle photography on Bluff Hill attention to shutter speeds is essential, but for great shots so is your viewpoint, and very often the lowest point of view is the best for hero shots of the speeding bike and rider as they approach and sweep by. 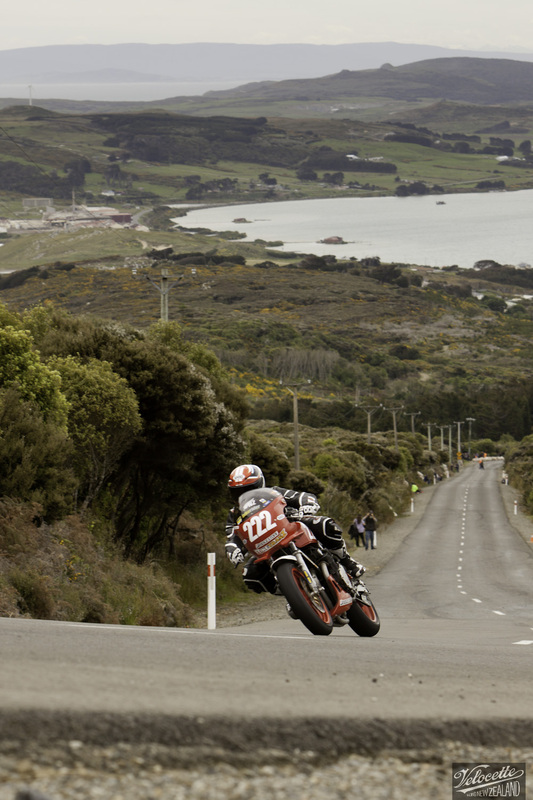 Rider 222 Kevin Kinghan enters the apex of Corner 6. A fast shutter speed freeze-frame is often not the optimum setting to be employed. To the contrary, when shooting motorcycle racing slower shutter speeds, around 1/300–1/350 of a second introduce the selective subject movement, specifically blurring of the rotating wheels, that intensifies the feeling of action in the image. The technique of ‘panning with the subject’ while tracking the action incorporates a slower shutter speed which keeps the main subject sharp while motion-blurring other detail in the image through the lens. This gallery of contains start-to-finish sequences of shots of all the riders in Post Classic Pre ’82 Class from three vantage points, ascending Flagstaff Road, Bluff Hill. Kevin Ryan exits Corner 5 aboard his 1966 Triumph Bonnie 800. “To capture breathtaking Classic Motorcycle action photos is something of a high-wire act. To compose the sharper image, well exposed, smooth reactions and speed are only part what of what is needed on the course by the photographer. The other elements are knowledge, awareness, and because you‘re bound to keep a safe distance from the action, being well prepared with a couple of cameras with long lenses that cover a good spread of focal length. Knowing the sport, the position of the sun relative to the sections of the course that will yield optimum, well leaned over, high velocity, high-side photos is one consideration. Another is knowing where competitive riders are likely to bunch up and vie for position.. Familiarity with the track on the day, and the sort of affinity with the sport that comes from chatting with riders, these all develop your instinct for what might happen next and where it is likely to happen.